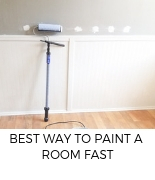 A room makeover doesn’t have to cost an arm and a leg. 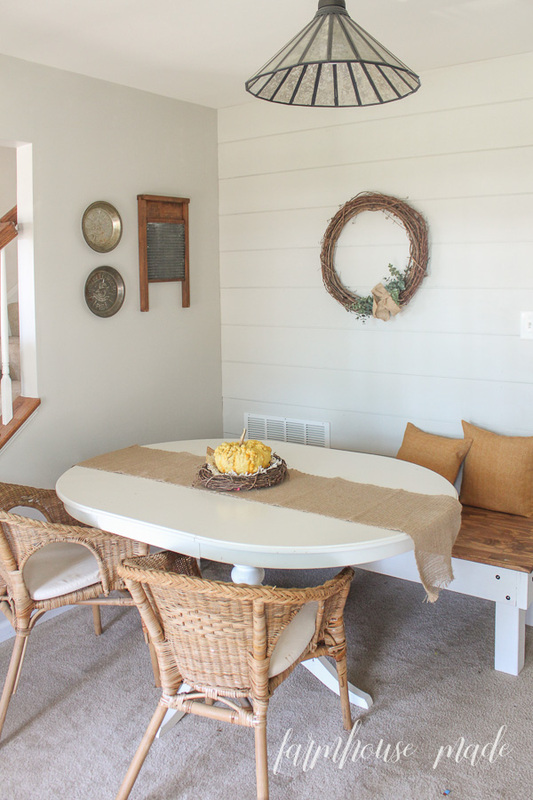 I did our farmhouse style dining room makeover on $100, and still have room left to get coffee! One of the big reasons we bought this house was because of it’s formal dining room. It sounds ridiculous, compared to all the selling points on this place (country, yard, porch, neighbors, square footage, pool…), but I like a few walls around my dining area. Since it was toward the top of the list, you’d think we eat meals in there all the time and throw massive dining room parties, but we don’t. I mean… there’s carpeting in there, and small children everywhere. So, we press on. I often work in there, the kids color and play in there, we eat once in a while in there for gatherings or when the mood strikes, I store all my plastic food containers in there, and I make coffee in there 862 times a day. But from a home decor view, it was a snooze and was in dire need of a makeover. 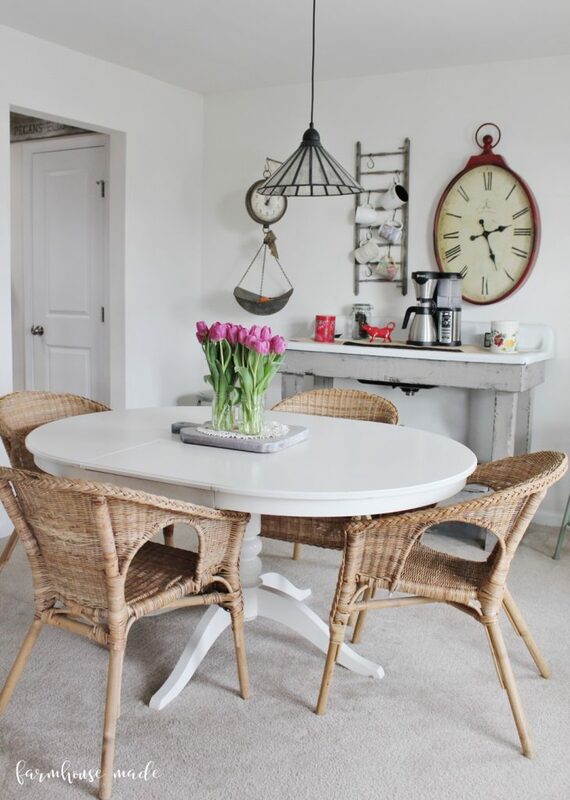 This room has been stuck for about 4 years now, and my $100 dining room makeover has finally been completed to work for us as a comfy and casual, yet technically formal, dining room! 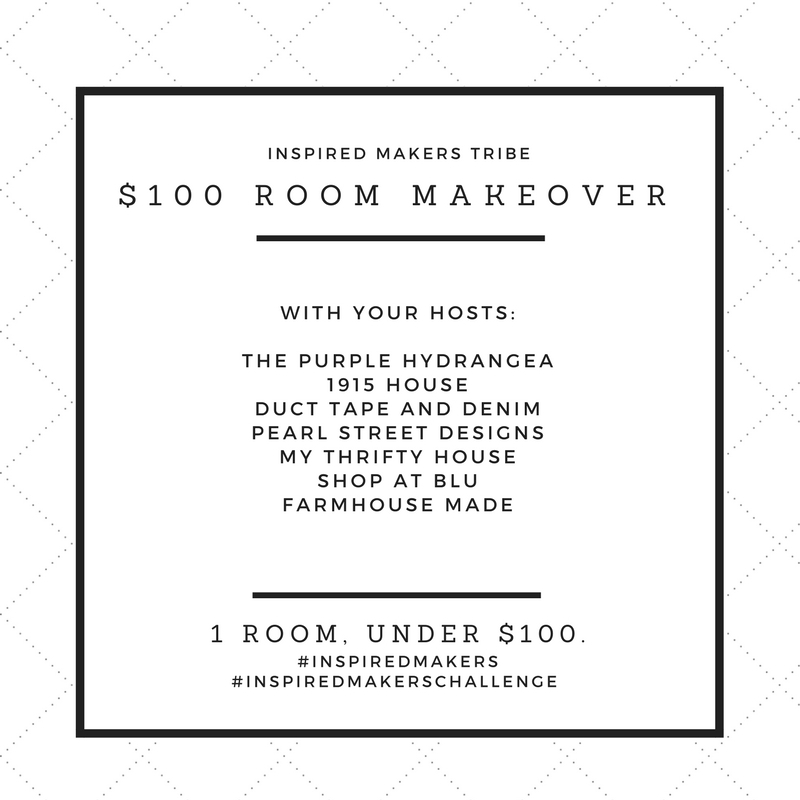 For our September challenge, we’ve taken on (once again) the $100 Room Makeover! 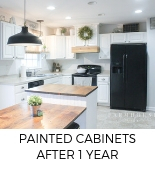 All it takes is $100, and 1 room needing an overhaul, update, refresh, restyle, or makeover. As always, follow along with #inspiredmakers and #inspiredmakerschallenge! 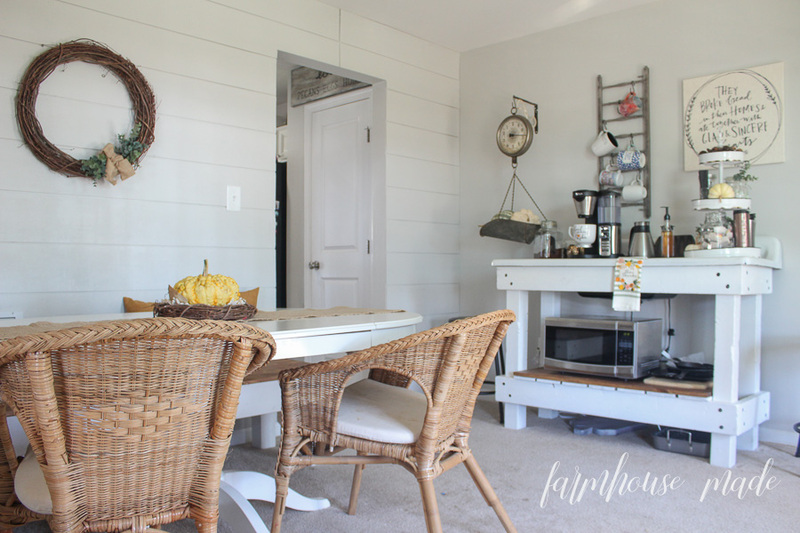 All I really knew was that I desperately wanted a breakfast nook and shiplap. A month or so ago, we added shiplap and painted the room Agreeable Gray. I also switched some things around. 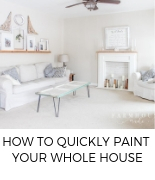 I do that a lot, when I decorate 1 room, there is an equal and opposite reaction of another room being emptied and undone. 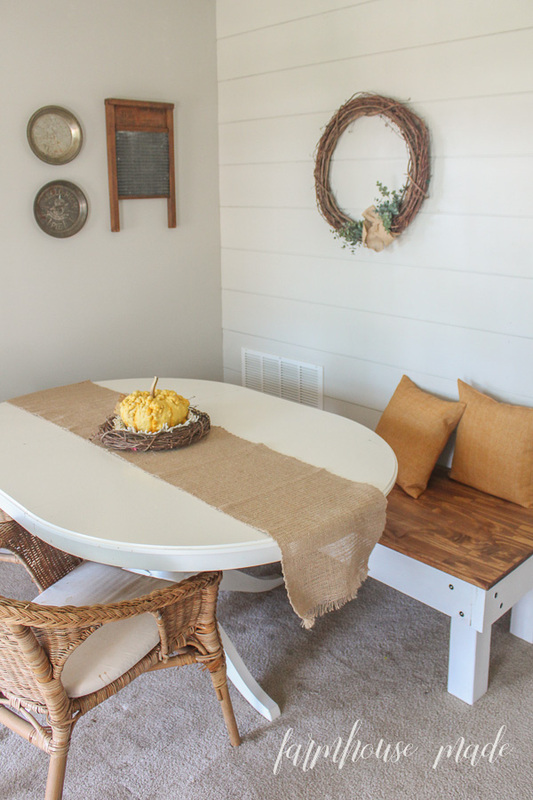 This is when I started getting the itch to do a breakfast nook with a bench to match the coffee bar, put this bench out on the porch, and to rearrange the clock between windows and the canvas hanging to the coffee area, and some other little decor things. So much for “having no plan,” right? 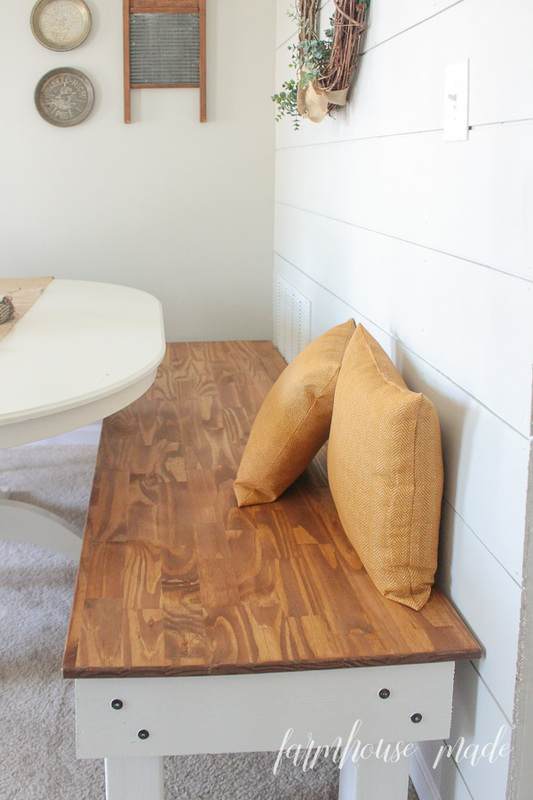 With the paint and shiplap out of the way a month ago, Andrew built me a wide bench (with fancy routed edges!) to match the coffee bar, which I painted Alabaster and stained the top of that, as well as the coffee bar shelf, Early American. I may or may not add cushions, but the kids are messy, and I don’t like doing laundry all the time. So, time will tell. 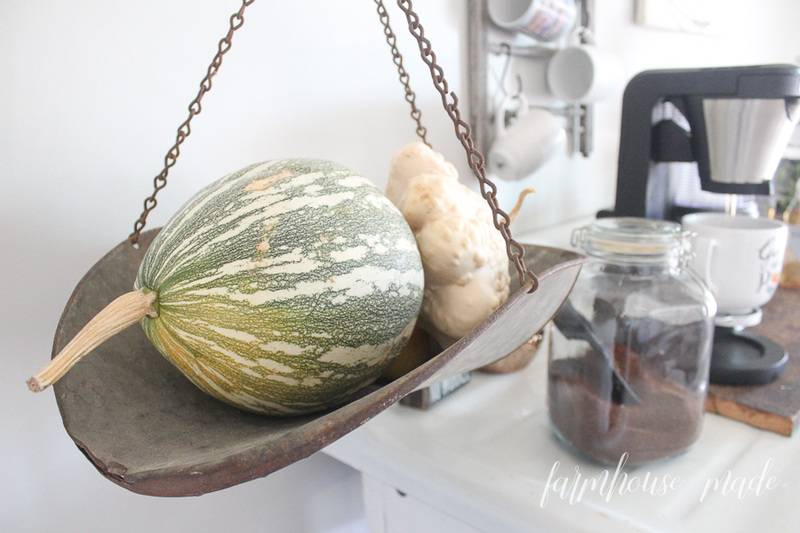 Outdoor pillows, a wreath with a doily and pumpkin in it… super basic, yet stuff you have all over your house. Including that rogue lego. This post contains affiliate links, which you can read about here. The coffee bar is all decked out for coffee brewing greatness and glory! Fall has made its’ way into the house, please alert the media on my behalf! I shopped the porch for the pumpkins, which I brought in from the porch because it’s been 90 outside. We go to a local market, and I’ll be getting a ton more of the teensy cutie pumpkins for this little tray. 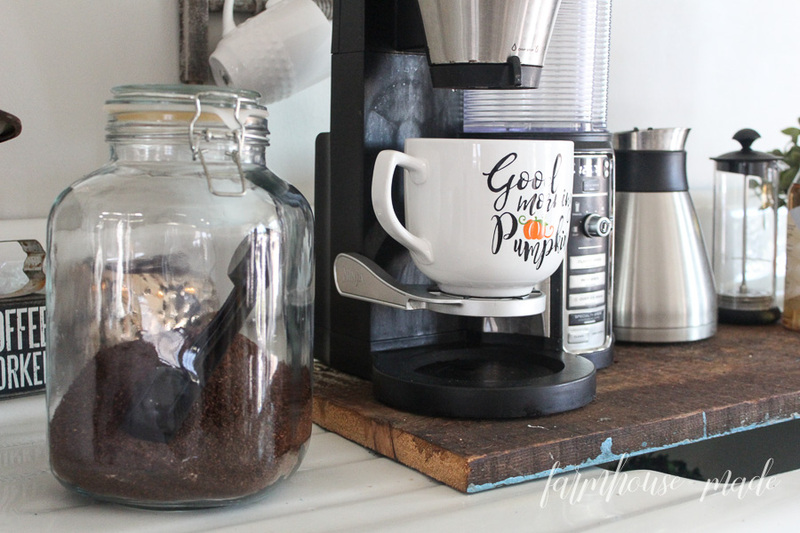 The coffee mugs hang on my old crib railing what I whitewashed, the coffee maker sits over the antique sink hole on a piece of reclaimed wood, and that scale was am amazing find at a local antique market! 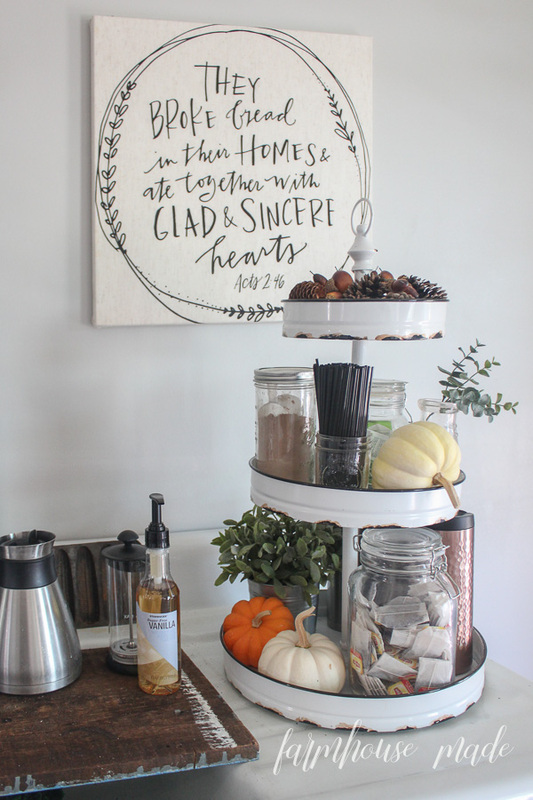 I’ve always wanted a tiered tray, but never knew how to style one. I still don’t! What’s that one thing you’ve got, and have no idea how to style it, or what to do with it? 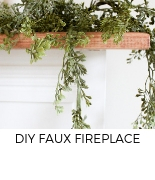 A mantel, a shelf, a coffee bar? This tray is mine. I just decided to toss on there all the things I have ever used in my coffee, my mom uses for tea when she comes over, and acorns. 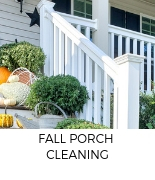 Because, it’s fall, y’all! That mug, by the way, is HUGE. Think, bowl with handle. 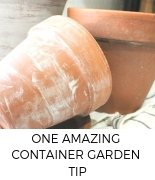 And all my metal jars with locks come from Walmart or Hobby Lobby. We keep our art supplies in there as well in the playroom! I dig it! The only thing we really really have to do, in the remotely near future is get new chairs, and I’m dying to get a rectangle table top onto the pedestal. These are my favorite chairs and table, all from Ikea, but they’re 4 years old and slightly rickety. You can read about the broken chair, here. Looks like i’m going out to grab $6 in coffee! So, while there is still carpeting (for now), it’s very comfy and functional to work in, and dare I say – eat in! Sarah, you are so sweet girlfriend! 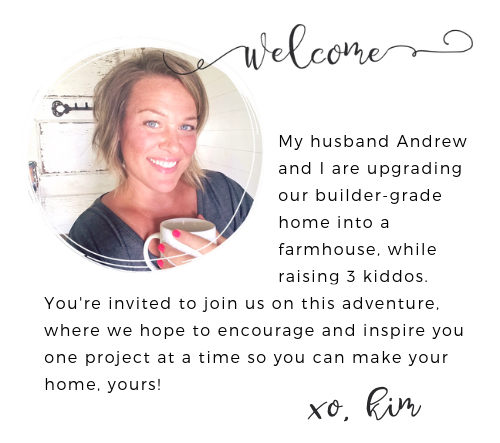 Kim I can’t remember ever reading a blog that brought Physics into a room makeover. Haha. That bench is just darling. It is a nice large size that you will be able to use for a long time. Loving the coffee bar. Beautiful job! Haha! Physics was my worst class in HS too! Thanks girlfriend! 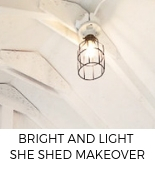 I love everything about this makeover. 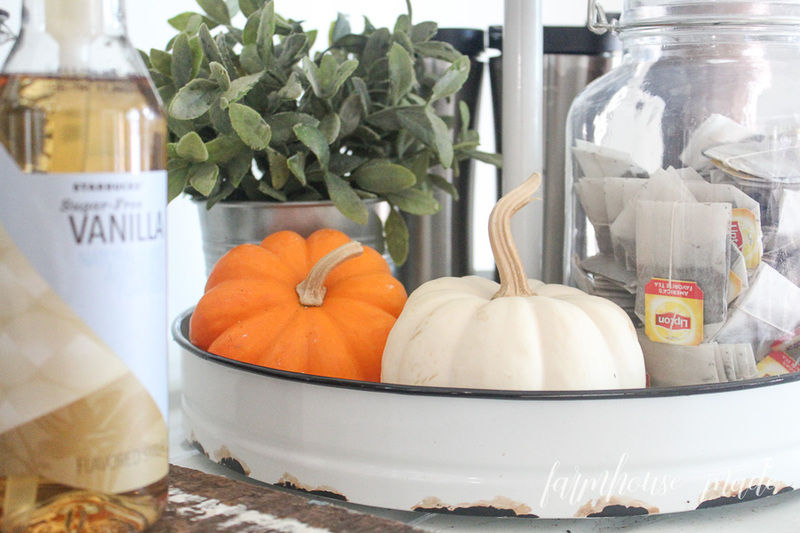 Strangely enough, my favorite thing might just be that nubbly pumpkin nesting in the grapevine wreath. The walmarts, girl… get your coffee bowl at the walmarts!!!! I am SO with you on the nubby bumpy pumpkin too! Not gonna lie…the before pics were pretty cute too. But I am in love with that coffee bar set up. Ok…the shiplap wall is drool worthy too. 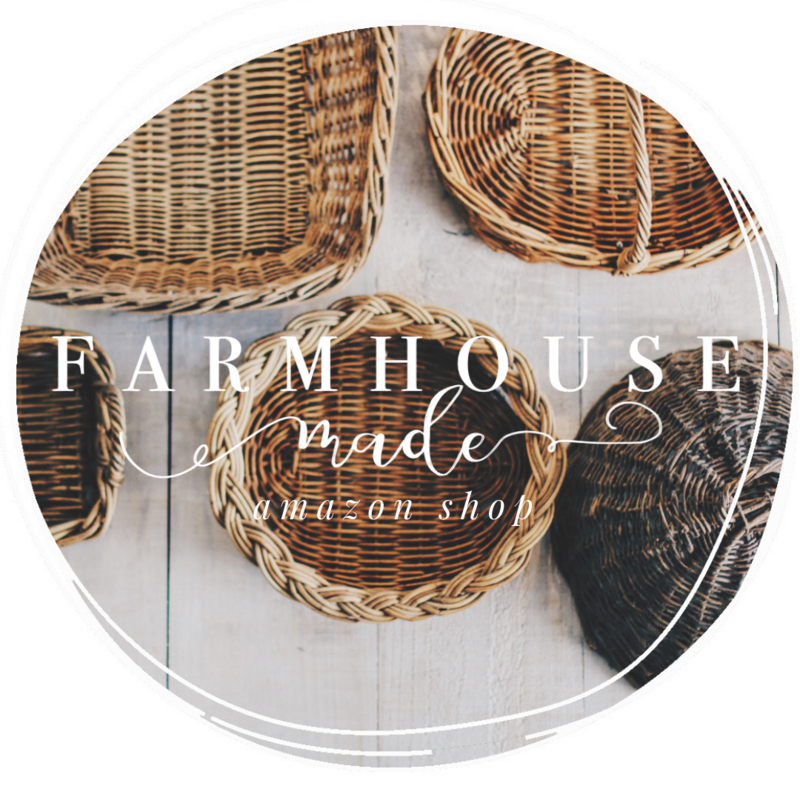 Great job Kim…love it all. One idea came to mind while totally enjoying your post. 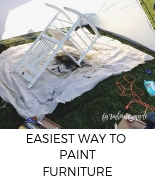 How about adding one of those plastic carpet covers (they use under office chairs to make rolling easier) under your table…protecting your carpet and making cleanup easier. Love The way this roomlooks so warm and welcoming. I always wonder why these makeovers never include labor costs 🙁 I mean, isn’t your time worth something??? Yes, I’m a DIYer myself but when I figure out costs to do something verses having it done, I try to factor in some approximate labor cost to sort of even out the equation. Absolutely! 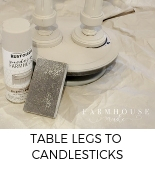 All our time is worth something, but many DIYers DIY home projects because the sweat equity in something (or just the love of DIYing something) outweighs the cost by hiring someone to do a project, however there are a few projects I have done a few times, that I would much rather pay a pro to do. 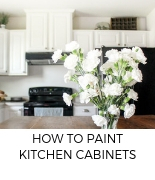 I don’t include my personal labor costs in any of my projects on the blog here because most people reading this are here to get ideas on how to do things themselves to save money and get that sweat equity. I love the your new dining room layout. 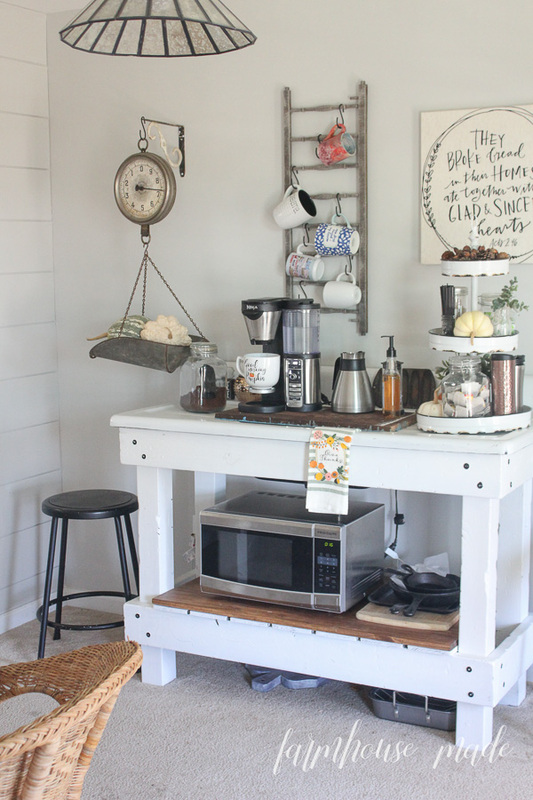 The breakfast nook and coffee bar are perfect together and make the room cohesive. All the vintage stuff is awesome. The new room is so beautiful! You should be so proud of it. Great job! Very pretty! Love all the white, which is always so crisp and fresh looking. I love the colors you have chosen. 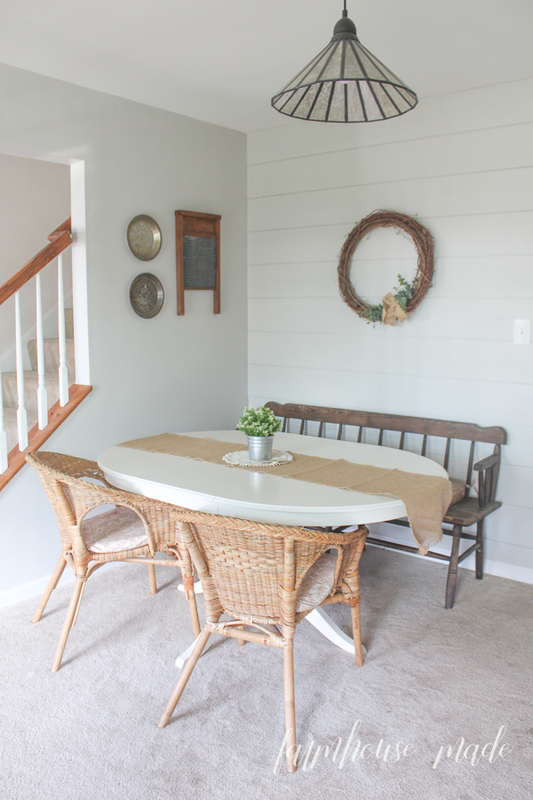 Is the shiplap the same color as the wall color? Hi Kandace! Yep, it matches the walls in this room.